Food has almost always played a significant role in Susan Dinneen’s life. For most of her career, she’s been a professional caterer with a passion for helping those without the means to buy food. It was only a matter of time before she joined Philabundance as a volunteer. Like many first-time volunteers, Susan’s first experience with Philabundance was packing food boxes in the distribution warehouse. She later found her calling in produce rescue at the Philadelphia Wholesale Produce Market (PWPM). The PWPM is the world’s largest fully-enclosed, fully-refrigerated wholesale produce seller for local food businesses, including several grocery stores. Although the opportunity at the PWPM is fairly new for Philabundance volunteers, there is much work to be done due to the large amount of unsold produce at risk of being wasted. Each week, Susan typically serves alongside other individuals and corporate groups sorting through unsold produce. Items in good condition are transported to the Philabundance warehouse for repackaging. Produce that may not last until it’s able to be redistributed to clients is sometimes sent home with volunteers for immediate consumption. On one occasion, Susan took home 18 pounds of ripe plums and made jam that she donated back to Philabundance! 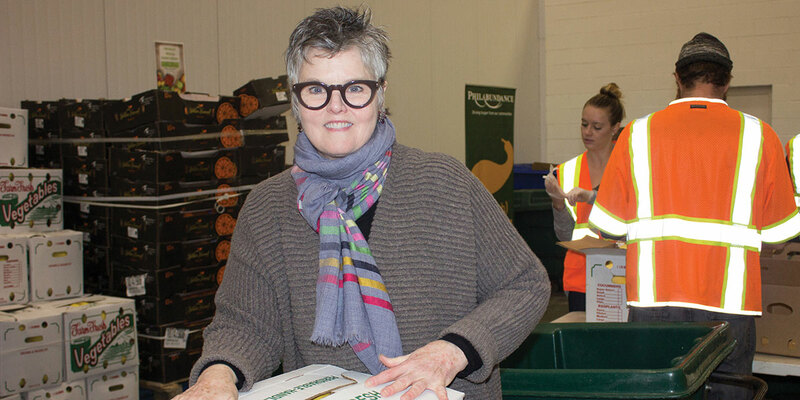 Susan said, “Especially in this country, there’s so much waste of produce.” By rescuing produce at the PWPM, volunteers like Susan help connect food that would otherwise be wasted to those who need it most. Beyond the difference she feels she’s making in the fight against hunger, Susan said that the people she works with help her stay motivated to continue volunteering each week.